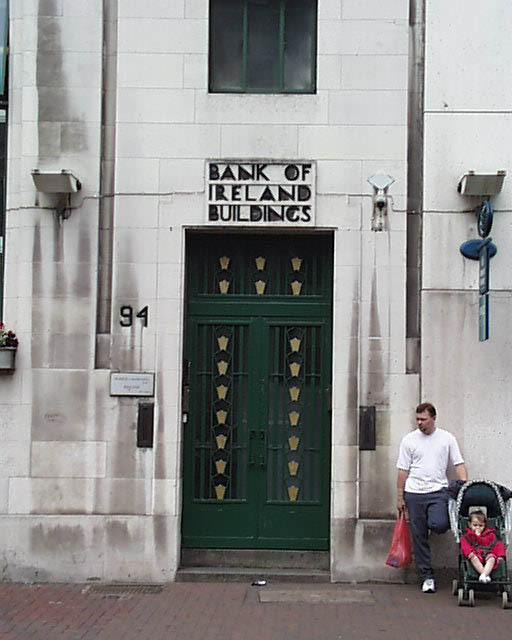 A fabulous Art Deco building finished in Portland Limestone, on an important corner site in Belfast, this Bank of Ireland branch closes off the long Royal Avenue vista. The building has three bays along North Street and four bays on Royal Avenue, meeting at a chamfered corner. The corner is capped by a typical Art Deco style tower and clock and features decorative metal panels between the windows. The Irish Builder described it as opening as “frankly modern in design” and “the best modern building in Belfast”. Since the bank closed in 2005, the building has fallen into disrepair. Now derelict. Grade B+ Listed.